In the space of three years, Chinese investors have transformed Tajikistan’s cement industry. A handful of new, large Chinese-funded cement plants increased Tajik production of the material fivefold between 2013 and 2015, amid huge overcapacity in the Chinese market. Chinese cement companies are facing a tougher time at home, as profits fall and less efficient, more polluting plants are forced to shut down or pay the costs of environmental damage in the wake of new laws and a crackdown on pollution. Cement is one of the world’s most polluting industries and a major source of carbon dioxide and smog that is causing a health crisis in China. Chinese producers are now scouring the world for locations where cement prices are high and local competition weak. Tajikistan fits the bill for a small number of Chinese investors. However the country’s tiny domestic market, rampant corruption and increasing competition from Chinese cement plants across Central Asia has limited opportunities for further expansion. 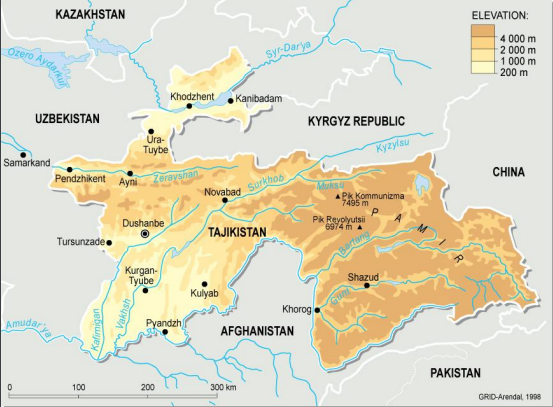 Tajikistan is the poorest of the former Soviet states. Mountainous and landlocked, it borders China to the east and Afghanistan to the south. After the collapse of the Soviet Union in 1991, the country struggled to support itself as a newly independent state. Living standards deteriorated and by 2000 GDP per capita dropped to just US$139 (927 yuan). Large numbers of Tajiks left to work in Russia’s booming economy and send money home. As a result, the Tajikistan economy grew at over 6% per annum between 2000 and 2014. But the country remains poor with limited industry. Currently remittances comprise as much as 50% of GDP, though estimates vary. Beyond this, cotton and aluminum exports are major sources of revenue. Tajikistan’s cement industry suffered from post-Soviet de-industrialisation. In 2013 the country produced a miniscule 30,000 tonnes, with about 3 million tonnes imported from Pakistan, Iran and Kazakhstan. At the same time China’s domestic cement, like many other industries, is vastly oversupplied. Between 2011 and 2013, China produced more cement than the US did in the whole of the 20th century - approximately 6.6 gigatonnes. The Chinese government is now explicitly supporting Chinese producers to move excess capacity offshore. It is seen as one of the major planks of China’s One Belt One Road (OBOR) initiative - a plan aimed at improving infrastructure and providing a huge market for Chinese investment across Asia and beyond. Central Asia is one of the key regions for the initiative as it can provide an overland pathway to markets in Europe and the Middle East. However, it is difficult to gauge the impact OBOR has had on Chinese investors in Tajikistan. On the one hand there have been numerous industrial processing projects signed since Xi Jinping announced the “Belt” component of OBOR in Kazakhstan in September 2013. But these may have been proposed anyway. Moreover, the two main Chinese cement investors began laying the groundwork for their projects by 2011, even though they both now brand their projects as “OBOR”. While a handful of Chinese investors have signed agreements for cement plants in the country, only a small number of investors have actually constructed plants of any scale. The most prominent investor, Huaxin Cement signed an agreement to build a 1.2 million tonne per annum (mta) cement plant near the capital Dushanbe in 2011 and was Huaxin’s first overseas project. A second 1.2 mta Huaxin plant opened in northern Tajikistan in March 2016 and asmaller Huaxin plant is scheduled to open in the southern city of Dangara later in the year. Another joint venture between a private Zhejiang producer and domestic producer,Tajik Cement, opened a 60 mta cement production facility in April 2015. It is rumoured this plant will expand capacity to 1.5 million tonnes per annum. There have been numerous other announcements for future Chinese cement plants but it remains to be seen if these materialise. The Chinese cement plants mainly use coal for their fuel. The companies claim that their plants are using advanced environmental and energy saving technology, without specifying exact standards. It is almost certain that they use cleaner technology than the small pre-existing cement plants in Tajikistan. However enforcement of environmental regulations in Tajikistan remains lax and limited government transparency makes independent verification difficult. The new plants seem to be proving profitable. Huaxin vice president and deputy general manager Wang Ximing (王锡明) said in an interview that its initial project was profitable within its first year. He added that prices are much higher in Tajikistan than China or even Southeast Asia. Moreover, major Chinese cement investors receive tax concessions in Tajikistan. Chinese companies in Tajikistan also face less hostility than in other Central Asian countries. In Kyrgyzstan and Kazakhstan, protests against Chinese companies, and laws perceived to benefit Chinese companies, have been relatively commonplace. These have not materialised in Tajikistan probably due to greater levels of autocratic control. There is palpable concern that Chinese companies don’t employ enough Tajiks. Huaxin, for its part, argued that its first plant would create jobs for 1,000 locals. From various visits to Chinese industrial projects, I have observed a mix of locals and Chinese working. This mix varies by industry and company but Tajiks are often employed in the unskilled labour jobs while skilled workers and engineers tend more often to be Chinese. There are exceptions – a quick LinkedIn search of Huawei Tajikistan reveals numerous Tajiks working in senior engineering and management positions. Of course, unskilled Chinese labourers can be found in Tajikistan too. Tajikistan is experiencing a construction boom in the major cities funded by remittances from Russia and corruption seems to be driving this increase. Regardless of growth, Tajikistan’s small market is no solution for Huaxin’s or other large Chinese producer’s domestic woes. One solution is for Chinese companies to export their product to other parts of Central Asia. In fact Chinese cement producers in Tajikistan have reportedly begun trial runs of exports to Afghanistan as well as Kyrgyzstan and Uzbekistan. Furthermore the Tajik government seeks to become a net cement exporter by 2020. But there are limits. First, Chinese companies are promising to build cement plants across the region, and so could find themselves in fierce competition. Wang Ximing of Huaxin already flagged the need to avoid excess competition between Chinese firms in Tajikistan. Second, corruption inhibits Chinese investors in the country. Interviews with Chinese investors in Tajikistan indicated that they faced petty corruption in many of their daily business interactions. Moreover at a project level, it is necessary to navigate Tajikistan’s web of patronage or risk being shut out of the market. A Chinese investor Shangfeng Cement (上峰水泥) was forced to cancel a cement project with a local partner after it failed to receive the correct documentation from the Tajik government, according to a company announcement. Finally, economic instability remains a problem. Remittances from Russia have fallen across Central Asia in recent years. This could lower regional demand for cement. It has also led to large fluctuations in the Tajik Somoni’s exchange rate which Huaxin reports as having a “fairly large negative impact” on its profits. These challenges mean that most of the easy profit-making cement projects in Tajikistan could already be taken. But though the short term benefits for Tajikistan are already palpable － cement is one of the few industries thriving in the country － this boom could rapidly peter out leaving the country with stranded concrete assets to clean up.